In 5th Grade with Teacher Julia: A Peek at My Week w/ an Alaskan Skype Date! A Peek at My Week w/ an Alaskan Skype Date! Hi Friends! I am linking up with Mrs. Laffin's Laughing because I love her blog and love Linky Parties!! We had SUCH a fun week (Dec 2 - 6)! I can't believe I only get 2 more, and then it is Christmas break! That bums me out a little bit, but at least I will get a lot of time with my family and then time to plan the second half of the school year. I absolutely love when I have an entire day(s) that I can dedicate to planning! The Middle School History teacher's brother has lived in Alaska for 13 years! I got his information and when I asked if he would like to Skype with my class, he was more than willing. He even put together a video for me to share with the students beforehand! I love when people love to help others! This was such a great experience for my students! Each student asked a question, and Jeremy answered with TONS of information about Alaska. Some of the points we hit on were the Northern Lights, cool animals he has seen, the Blanket Toss that he saw, what his life is like there, and he even shared with us his story as to how he ended up in Alaska! Afterwards, we reflected on how great it was to talk with someone so far away about the things we are studying in our classroom. We were sure to give him a huge THANK YOU for waking up at 4:30am to talk with us! Students are continuing to do research on their specific state of study. 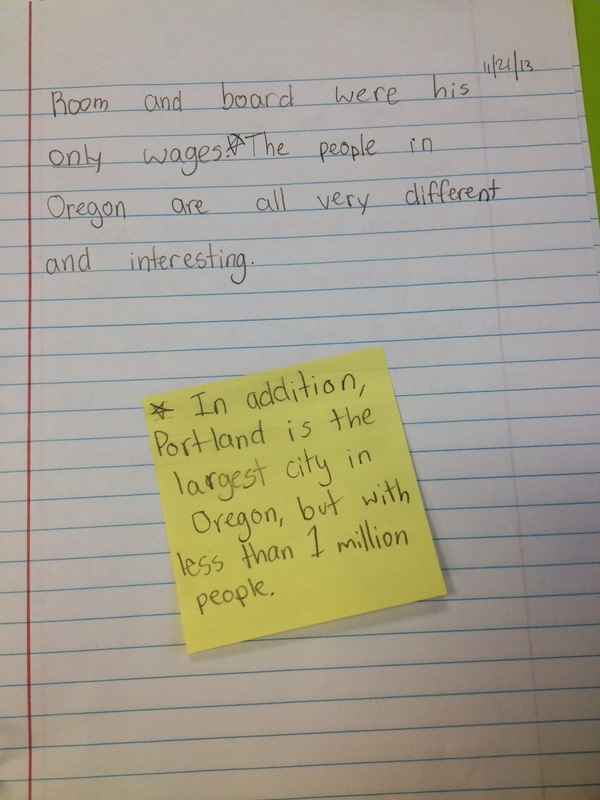 At this point in the unit, I have students thinking critically about what they are learning. This week, they met with a partner (their Writing Partners in Writers' Workshop), and compared and contrasted the two states. Afterwards, they shared their findings with the class. It was great to see the deeper level thinking that went on throughout their conversations. With the research papers, I focused on Revising this week. 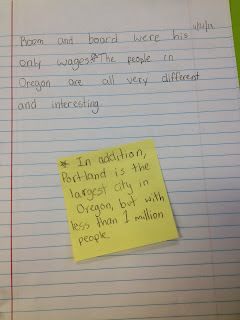 I am trying a new method where students use Post-its to revise their work. Some of the skills were to "show, not tell" your readers a fact or idea in the essay, add state specific vocabulary, and to revise for a Lead. I like the Post-it note idea better than revision slips which I have used in the past. I had students write on strips of paper their revisions and tape to the side of their papers. Post-its work so much better because you are able to move it around and it looks much more organized. I am having my students complete a science experiment at home, completely on their own (I say on their own as in without me. I know that parents are guiding in a very big way here!). I knew it would be a disaster if I just simply gave a due date and never spoke of it again. Who knows what would show up the day of! To avoid an embarrassing display of half-effort, last minute work, I am taking my students through the syllabus I gave them in my classroom with my own science experiment. I am literally doing everything they should be doing to SHOW THEM exactly how it needs to be done. Aside from coming to their houses and working with them, this is the best way. Since last week was a 2-day week due to Thanksgiving break, I completed 2 weeks of work that needs to get done: completing the experiment, graphing and analyzing the data, and planning (by sketching) how I will set up my board for display as well as how I will display my procedure and results. They saw me set up my experiment, take pictures as it was happening. We all graphed the data and made conclusions. Everyone discussed how the board should be set up, and are ready for Week 5 of the syllabus! The 3 pieces of ice at the beginning. 1 hour and 17 minutes later, one ice cube has melted. 2 remain. 3 hours and 3 minutes later, the second ice cube melted. 4 hours and 15 minutes later, the third ice cube has melted! That took waaay longer than we thought it would! We ended the week with a discussion of Nelson Mandela. I believe that as educators, we cannot ignore something like this. I think it is so very important to acknowledge, teach, analyze, brainstorm, discuss, question, and connect to the things that happen in our world especially if they are happening right now. Usually I start the day with a response written on the easel. Today, I projected a picture of Nelson Mandela, a short script of his life, and 4 quotes from him. The students read the script and quotes and we had a brief discussion of Nelson Mandela and his life. Then, the students chose a quote and reflected on it. Afterwards, we came to the carpet to discuss this man and his amazing contributions to our world. The children really connected to what was happening in their lives - challenges they have or have to overcome, never giving up on what they want, the idea that teaching love is important because humans accept that more naturally than hate. Time and time again, we have conversations like this and each time my students show me what wonderful human beings each of them are. What was your week like? Did you do anything fun? Inspiring? Exciting? I Get to Have So Much FUN! !